Vijeta - you feel like a victor watching it! Govind Nihalani has been one of the foremost flag bearers of what has come to be known as the "parallel cinema movement" in the Hindi film industry. Starting off as a cinematographer who ably assisted Shyam Benegal in bringing unforgettable stories like "Ankur" and "Bhumika" to life, Nihalani made his directorial debut with "Aakrosh" - a grim tale of exploitation of the downtrodden and corruption in the judicial system. The grittiness, which was on display, was there for all to see in his subsequent ventures like "Ardh Satya", "Party", "Aaghaat" etc. 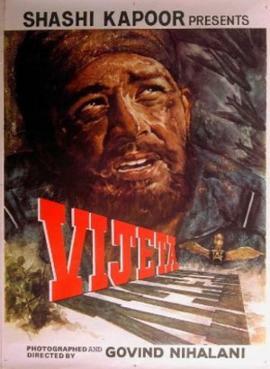 However, his very second movie "Vijeta", released barely two years after "Aakrosh" would be a surprise, certainly not unpleasant, for anyone who has been introduced to Nihalani through his tales of stark realism. That is not to say that "Vijeta" is a work of fantasy like most Bollywood potboilers are. The movie has a thoroughly believable plot, authentic characters and is devoid of songs, dances and the assorted titillations which make up a "masala" film. Despite that, there is a feel good factor about this movie, a rare uplifting quality, which we do not associate with art films. Prima facie it is what we call a "coming of age" story, revolving around Angad Singh, a Bombay-bred young Sikh born to a Maharashtrian mother and father who meanders aimlessly through life until making an abrupt foray into the tough world of Indian Air Force the demands of which force him to come out of his shell. Needless to say, Angad Singh emerges as a "vijeta" (victor) in the battlefield of a war between two nations as well as the battlefield within himself. But what is really remarkable that its brilliant scriptwriters - Dilip Chitre and Satyadev Dubey - come out with a screenplay in which no character can be termed as a loser. Every character appears to be a victor in his or her own way. Let us take for example the character played by Shashi Kapoor. Nihal Singh, Angad's father, is a Sikh who escapes the trauma of Partition, settled down in Bombay with his mother (played to perfection by Deena Pathak), marries Neelima (Rekha, about whom a few words will be said later) and becomes a part of the advertising industry to eke out a comfortable living. In his emotional vulnerability, Nihal is matched only by his own son Angad which leaves the relationship between for much part of their lives. Though not an incorrigible philanderer, Nihal's impetuosity leads him astray much to the obvious distaste of Neelima and to the horror of a young and impressionable Angad. Realizing, after many brusque episodes with his wife and son, that vanity is going to offer no solace the sardar finally learns the right lessons, loosens up and starts respecting vulnerability - within himself, his son Angad and all else whom he comes across in the journey of life. This is about two characters which seem to be infested with the biggest flaws. The others are simply inspiring though not in the quixotic sense of the term. Neelima comes across as a woman of steely resolve with loads of compassion without which do not make her appear or sound cold. When her husband tries to explain away his escapades by suggesting that the woman he got briefly entangled with was loose, she is quick to retort that while she could have been a struggler compromising herself to secure a career, he had wittingly or unwittingly exploited her and was later trying to justify himself. The reserved Neelima never lets her disgust to spill out before Angad, even though this does not prevent the young lad from knowing what she did not want him to know. Moreover, her differences with Nihal do not affect the relationship she shares with the latter's old mother and even her brother (Om Puri in a fine cameo) - when he visits their place - makes it a point to seek the blessings of the old Bi ji before talking to anyone else. In a way, Neelima facilitates the redemption of her husband and by virtue of her stoic support to his son's painful attempts at self-discovery, helps Angad evolve into a man capable of empathy and enduring the toughest challenges and the greatest tragedies. There is also an advocacy of pluralism in the most non-preachy fashion. Nihal has cut his hair short after coming to Bombay. But when his son his born, his mother insists that he be brought up as a Sikh who wears his turban and beard. This becomes possible since Neelima - a Maharashtrian Hindu who practices classical music - raises no objection. 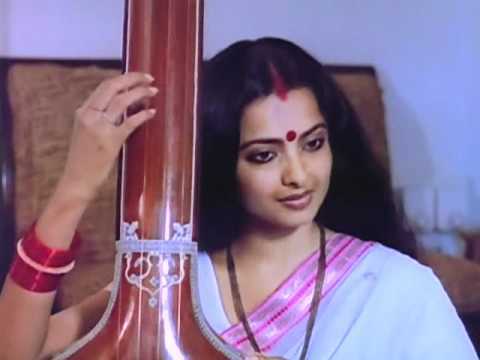 No scenes are created when Angad falls in love with Anna (Supriya Pathak), the daughter of his Chief Instructor (Amrish Puri brilliantly plays an officer who can be both tough as well as tender) though they happen to be devout Christians. Neelima gets killed in a road accident leaving the father-son duo alone. Tragedy soon befalls Anna as well as her robust father succumbs to an attack of galloping cancer. War breaks out and Angad is out defending his borders. Anna moves into Nihal's house and the effortless ease with the two establish an emotional bond is simply heartwarming. There is also an invaluable sequence in which the perils of untamed nationalism are exposed - so relevant to our times. One of Angad's colleagues ejects when his aircraft catches fire. He does not land in enemy territory, yet local inhabitants - except for a few patient but ineffectual elders - mistake him for a soldier belonging to the enemy country and are hell bent upon lynching him. This, even when he has not yet pronounced his name which would have revealed his Muslim identity as well. Timely arrival of an IAF helicopter saves his life but the question posed by the episode holds as much relevance today and more so for the educated middle class than the illiterate villagers whom the aforesaid sequence featured. Yet another highlight of the film is technical, though it would not be lost on anybody who is not indifferent to splendour. As said earlier, Nihalani had started off as a cinematographer and here he displays his command over the camera with consummate finesse. Angad's training at the IAF has been shown in great detail which include the hiccups he faces in mastering his flyingo lessons. Nihalani performs magic through his lens making us share Angad's fear, anxiety, panic and subsequent discovery of self-confidence. For anyone who has undergone a tough and depressing phase and wishes to recover through something sensibly refreshing, "Vijeta" is what the doctor may prescribe!